Passed from generation to generation, tradition is a great foundation for many beliefs. Share your favorite traditions with your friends and family. Approx 1.75" wide; stiffened for extended wear. A brilliant blue crystal center on on a blue and black plaid. For boys, for Hanukkah or just to add a touch of bling! A bigger Hot Bows style with all the elements of Christmas. Red and green, sparkle, tinsel like threads. This is a holiday must have! Stiffened for extended wear; approx. 2.5" wide; ribbon 1.5"
A sugar frosted cupcake garnished with holly in a cute snowflake decorated cupcake wrapper is the center on a red and white striped fabric. Stiffened for extended wear; approx. 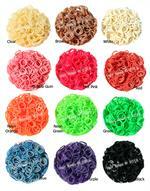 1.75" wide; ribbon is 5/8"
5/16" Medium Latex Bands; do not store in heat or sunlight; each bag has 50+ latex bands. Colors are limited to the selection available. Packaged for resale or for personal use. Price: Wholesale customers only. Wholesale login required to purchase this item.